The other week, my two siblings sent me a robot arm toy for my birthday. I have a bad history of cutting, burning, and shocking my hands while working on my hobbies, so the idea was that I could use this robot hand instead of my own to save some skin. At first this seemed a little silly, but it got me thinking. Could I figure out a way to use this toy as a useful proxy of my own hand? The range would be limited, the carrying capacity would be small, and the joints wouldn't match my own arm, but there are still some instances where having a hand that doesn't spout blood when something goes wrong would be useful. One such instance is when dealing with the spinning propellers of a drone. In order to test the stability algorithm that keeps my drone in the air, I would really like to poke one side of the frame to see how it reacts. Putting your body anywhere near a large drone is a pretty bad idea (as I now know), so having a remotely controlled arm would be immensely useful. So I've started a new project to modify this toy arm to mimic my real arm movement. I see this project happening in at least 3 parts. 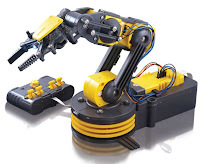 First, I need to modify the arm so it can be controlled by my own code. Next, I need find a way of using the position of my own arm as input for a controller. Finally, I need to come up with an algorithm that translates my own motions to ones the robot arm can handle. Through all of this I will try to stick to cheap(ish) electronics parts, because if I subject this device to the situations I've put my own hands into, it won't have a long life anyways.